Bringing you all the winners…from books to giveaways! Spring is well on it’s way and I couldn’t be happier to see things warming up a bit! Spring IS my favorite time of year, but with all of those wonderful April showers, comes along moss and mold growth too! (Ickies!) Moss and mold triggers allergy symptoms for the nearly 50 million Americans who suffer from seasonal allergies. What’s worse is there’s nowhere to hide either! The fresh air outside is full of pollen and allergens, while the air inside is full of a myriad of indoor pollutions. What can we do? Indoor air pollution can pose a problem in many homes. From pollen, mold and dust to animal dander and tobacco smoke, these indoor pollutants can create asthmatic and allergic reactions. To help reduce allergens and improve air quality, an air purifier with the AHAM Verified® seal is recommended. Guardian Technologies tower air purifiers, including the new AC9400, all carry the AHAM (Association of Home Appliance Manufacturers) Room Air Cleaner Certification. The new AC9400 has the highest Clean Air Delivery Rate (CADR) rating of all the Guardian Technologies air purifiers. The CADR is used by AHAM to measure a filter’s efficacy. The CADR indicates the volume of filtered air an air cleaner delivers, with separate scores for smoke, pollen and dust. The higher the CADR number for each pollutant, the faster the unit filters the air. The AC9400 CADR numbers are 259 (smoke), 263 (dust) and 275 (pollen). It circulates room air 4.8 times per hour, and is recommended for large rooms up to 402 square feet. It also carries the Energy Star rating, so although it packs power in improving indoor air quality, it does so efficiently. The AC9400 has a myriad of other features that make it unparalleled. Common household allergens such as dust mites, pollen, mold and pet dander are known to trigger an allergy or asthma attack. 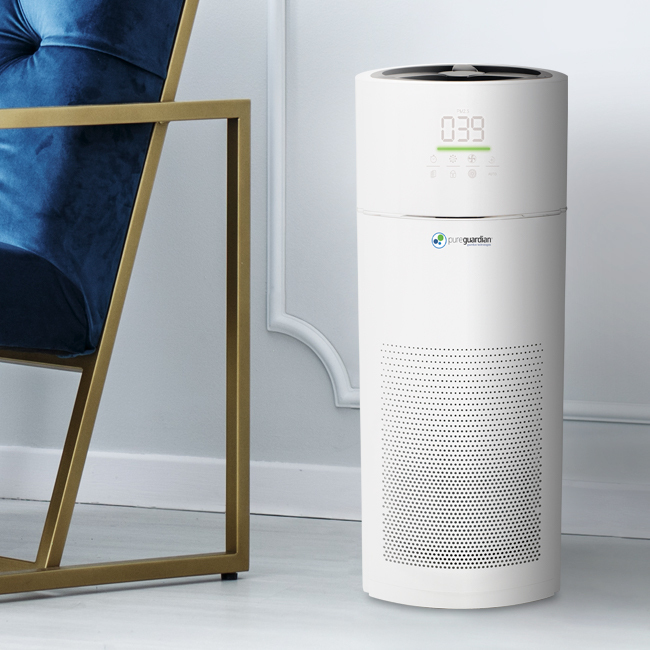 The 360° HEPA filter captures 99.7% of airborne particles .3 microns and larger, reducing the airborne allergens in the home. With the activated carbon layer of the filter, the AC9400 helps reduce common household odors including those from smoke, cooking and pets. The optional ionizer can enhance its ability to remove particles from the air. To keep the filter performance optimized, a filter indicator lights up on the display when it’s time to change the filter. Because indoor air quality can change during the day depending on the room conditions, an air quality monitor set in auto mode detects the amount of particulate matter (2.5PM) in the air and adjusts the fan speed to keep air fresher throughout the day. The numeric value of particulate matter is displayed while the light on the front of the unit changes color providing a quick, visual status of the air quality in the room. AC9400 users can choose from three speeds or select the turbo speed control for maximum airflow. No need to turn off the purifier at bed time. Light sleepers can let the purifier run through the night. When selected, the sleep mode feature will turn off the display lights, dim the power and switch to the ultra-quiet low speed. for more ideas on overcoming seasonal allergens. ENTER TO WIN a PureGuardian® Large Room Hi-Performance Tower Console Air Purifier (AC9400) from Guardian Technologies! The AC9400W contains a unique 360 degree HEPA filter that relieves allergies by capturing 99.97% of dust and allergens as small as .3 microns in size. It’s large activated carbon filter attacks common household odors including those caused by smoke, cooking and pets. AND, it works to reduce the many VOC’s that are emitted by common household products and cleaning . The large room purifier includes an Air Quality Monitor that detects the amount of particles in the air and automatically adjusts the speed to optimize room air quality when in auto mode. An ionizer option is built into the unit and can be turned on to boost allergen control. The ionizer emits negative ions that attract microscopic allergens to form larger particles that can be easily trapped by the HEPA filter. Specification and additional features: The purifier stands about 27 inches tall, has a timer up to 12 hours and a touch display with child lock. It provides powerful air cleaning and is ideal to use in rooms up to 402 sq. feet. Mommy’s Playbook Giveaway Rules: This giveaway is Sponsored by Guardian Technologies and hosted by Mommy’s Playbook. Victoria and/or Mommy’s Playbook, Participating bloggers, are not responsible for prize fulfillment. By entering this giveaway you are giving the giveaway host and/or event sponsor permission to retain your email address for future communication, you may choose to opt-out of such communications at any time. This giveaway is not sponsored or endorsed by any social media outlet including, but not limited to, Facebook, Instagram, Twitter, and Pinterest. Please contact Victoria (at) MommysPlaybook.com regarding any questions you have pertaining to this giveaway. I am constantly wiping furniture with baby wipes, vacuuming every day, and I clean with other natural products. There is always a light film of black that is quick to appear due to living so close to a major road. I don’t do anything currently, but would love to. I just try to keep the dust down by damp mopping hardwood floors, vacuuming carpeted rooms often. I try to keep my house as clean as possible- I have no pets, no carpet and no kids. My husband has allergies. We have never smoked and we do not have pets in the house. We do have a small air cleaning machine we keep in the bedroom. We have removed the carpet out of the bedroom and put down a hardwood floor. Keeping our windows shut this time of the year helps keep the yellow pollen out of the house. We change our air filters often. Thanks for the awesome giveaway! Unless noted, all giveaways are open to US only.